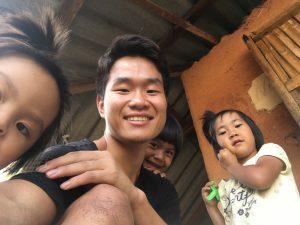 I started volunteering in ARC since I finished my studying abroad. I was just studying, hanging out with friends, I felt something not enough and I wanted to do something that can do only in Thailand. 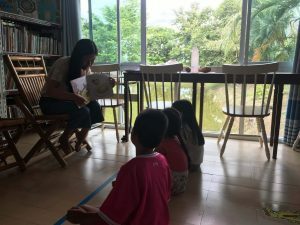 And it didn’t take time til making a decision because of there was a crucial reason which is Ms. Horiuchi, founder of ARC, and Phrao, beautiful town where I was living. I have known about Ms. Horiuchi from a teacher in my university. I couldn’t believe there is Japanese in Phrao such as a local area in Thailand. 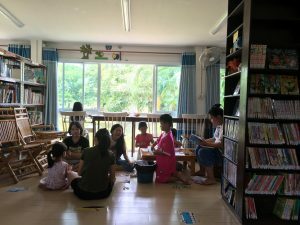 Rang Mai library, which is located in Phrao, is comfortable, cozy, and everyone can spend time with relaxing. This is because of building and environment, but it is just small reason. Actual reason is nice atmosphere made by staffs in library, and children’s smile as well. And since I came Phrao first time, I believed that it is made by Ms. Horiuchi’s character which is a calm but also powerful. 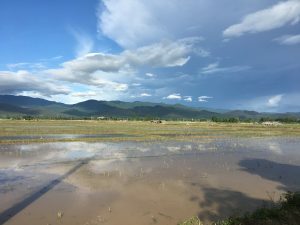 As I have lived in rural town like Phrao, it was really cozy to live, beautiful nature, everyone has energy, and kind. After they know I am foreigner, they tried to talk to me in English. I was really glad to live here, I was really fascinated with Phrao. Beautiful view on the way to town in Phrao. 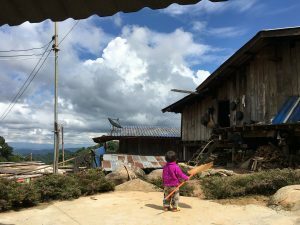 After a moment I moved to Phrao, I stayed village in Chiang Rai, with host family and “Akha” people that is one of the hill tribe in Thailand. I decided to devote everything that I can do during my staying in village. However, it couldn’t be going well in good meaning. Because I could have so much better experience than I expected. Their living, culture, delicious food and time with host family, everything was precious and I could have so much fun in short time. One thing I was really surprised, is villager’s living with team playing and their working style. Someone goes to town to buy foods, and fertilizer, which is essential for village, and bring it back to village instead of everyone going by themselves. One day if there are no parents in house, someone takes care of children, and live with them. I’ve never seen that kind of living style which is never exist “living alone”. Furthermore, sometimes they work as child minder, sometimes as architect, and as farmer. There is no actual occupation that they have to do. They just work for living. According to P’ nalae, who is my host family, I cannot know even part of their living, with staying only a week. I couldn’t believe it but I want to come back to stay for experience more. Girl watching sky in front of children center, “Sunshine kids center”, in hill tribe village. With children at “Sunshine kids center”. They are Interested in iPhone that I’m using. My activity in Phrao, everyone let me do whatever I want. Helping events, going children center by mobile library, and promoting funding programs with contacting some organizations and companies. I have noticed something that library is needed by people in town. It is obviously one part of town. Especially, I could notice how reading and learning has huge influence to people. Even if someone has never left town, books teach us. Even if they don’t know about world, books tell us. If there is no knowledge, books rear us. P’ jiew, staff of ARC, her story telling from book is messaging me even I can’t understand Thai. It would be less appreciating for something always besides us. Everyone, adults and children, who come to the library, make me notice what is important in life. 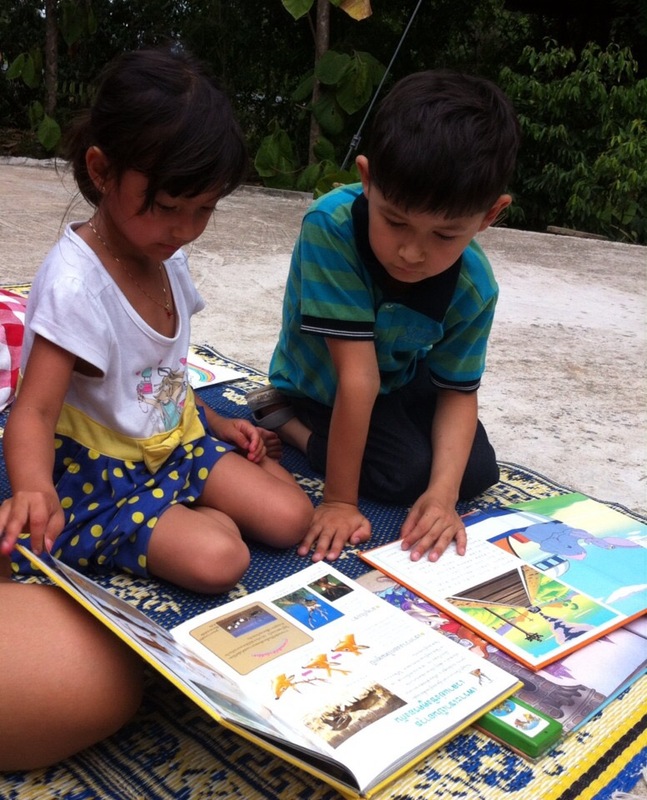 Story telling to children by P’jiew in library. Everyone can relax with talking, and reading in library. Living and volunteering in Phrao was really precious time for me. Every staffs are so kind, funny, and they made library is relieved place for me. Everything I saw, experienced, is being my confidence, and it changes to my next action. It was all thanks to Ms. Horiuchi, staffs, and people in village and town. I appreciate so much. I hope to see you again in Phrao!